According to Aboriginal oral tradition, side plates similar to the one seen on this British trade musket were spiritually significant for hunters and ensured fruitful hunting. The serpent side plate on this firearm also told Aboriginal traders about its origin. 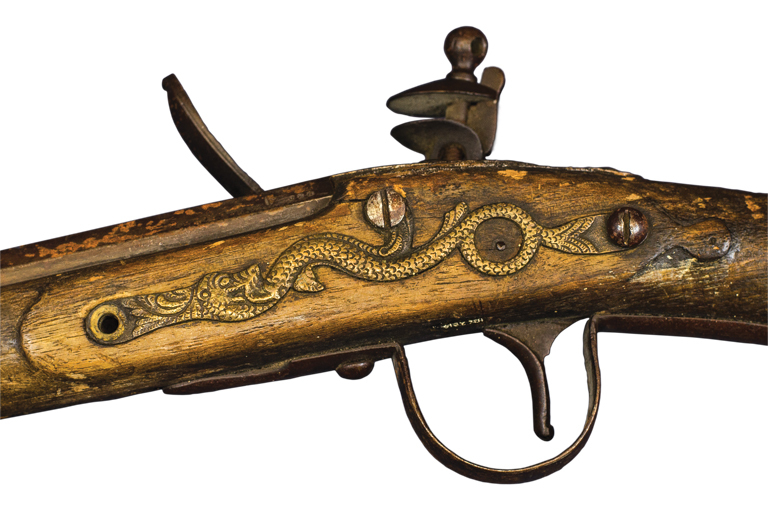 Beginning in 1690 English gun makers used decorative side plates in place of loops and scrolls, and by the mid-1790s serpent side plates were standard on British trade guns. This 1871 musket is a later version of a type traded by the North West and Hudson’s Bay companies to Aboriginal hunters in the 1700s and 1800s. Made by J.E. Barnett and Sons, the gun has a flintlock firing mechanism, which uses a piece of flint on the end of a short hammer to create a spark. Firearms were expensive because only blacksmiths at posts could repair them and because ammunition had to be bought through trade. Full length view of the musket. On the home front in World War II, Canadians lived a contradiction. They were told to save. And asked to spend. Eighty years ago, Ottawa took control of the business of banking. It was forced to. A great bank had collapsed and many Canadians were ruined.